Two clipped-wing Supermarine Spitfire V's of No 40 Squadron, South African Air Force serving in a ground support role. ER622/`WR-D' accompanied by `WR-C' patrols over the Tunisian battle-front ready to be called in for an 'air-shoot' by the Army. Supermarine Spitfire Mark VBs of No. 40 Squadron SAAF Detachment undergoing maintenance at Grottaglie, Italy. One flight of the Squadron was detached from Bou Ficha, North Africa, to No. 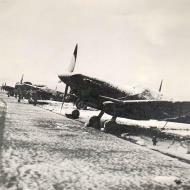 239 Wing RAF on the Italian mainland, to fly tactical reconnaissance sorties in support of the Allied Landings.